Wedding invitations with a regal finish, these seal and sends feature lavish flourishes in faux gold foil with a stately crest featuring your initials above your wording. An unforgettable introduction to your wedding day! 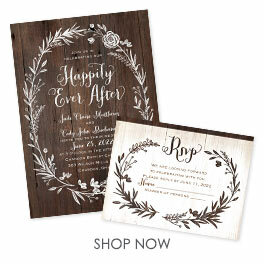 Personalization Options: Vintage damask pattern is printed in faux gold foil as shown. Wording is printed in your choice of colors and fonts. I like the simple design, and the initials on top. I know most product are not like the pictures the design on the real cards are not like the one in the picture. The pattern is more simply and is not as rich in color.